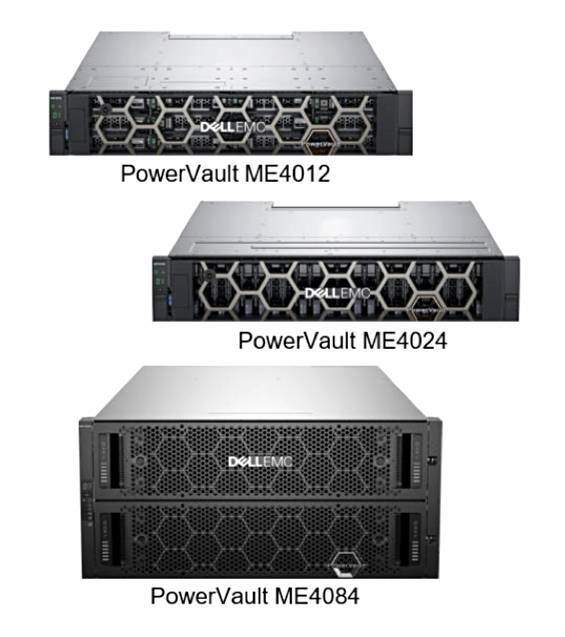 Dell EMC’s new PowerVault ME4 Series are for small and medium businesses: installable in 15 minutes, configurable in 15 more, and usable as either SAN array or direct-attached PowerEdge server storage (DAS). The company says it has more than 400,000 installed PowerVault systems and notes that its percentage revenue share in the entry-level external array market is, according to IDC, greater than the next six competitors combined. Compared to the previous entry-level PowerVault arrays the ME4 has 75 per cent more drives, 122 per cent higher capacity and a 4X increase in IOPS performance. But the product line is entry-level, with no Xeon SP processors, only single and dual Broadwell-DE ones. There are three models; ME4012, ME4024 and ME4084 with (you guessed it) 12, 24 and 84 drive slits respectively. The ME4012 and 4024 are 2U boxes while the ME4084 needs a 5U chassis.The ME4012 takes 3.5-inch drives; the others are 2.5-inch. The drives can be SSDs or 15K, 10K and nearline 12Gbit/s SAS disk drives, with all-flash and hybrid configurations supported. Check out the PowerVault ME4 spec sheet here and a datasheet here. The arrays are available now and pricing starts at less than $13,000.